Why Choose Monday Morning Flower and Balloon Co? Why should you choose Monday Morning Flower and Balloon Co for your special event flower and balloon decor? Monday Morning Flowers is owwned and operated by Georgianne and Kevin Vinicombe, they lead store operations along with a very talented team of floral designers, sales staff and delivery personnel. We are a full service floral shop specializing in Event Designs, using both flowers and balloons. With 5 vans and trucks on the road 7 days a week, we are easily assist in decorating hundreds of events every year. Whether your event is a social one or corporate, we are here to give you creative and affordable decor options. Did you know that we inflate over 40,000 balloons each year and secure flowers from all over the world? Let our team of talented and friendly staff help you make your event one to remember. Monday Morning Flowers uses quality products like Qualatex and Anagram balloons. 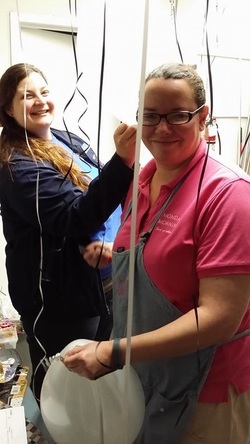 Balloon and Flower decorating for : Prom, Formals, Corporate Events, Bar Mitzvah, Bat Mitzvah, Birthday Parties, Trade Shows, Convention, Grand Openings, Bridal Showers, Weddings, Baby Showers, First Birthday, Quinceneras, Sweet 16, Graduation, Memorial Services, Holiday Party, School Events and more! Email us at customercare@mondayflowers.com or call us at (609) 520-2005 to plan your event today.